To earthquake-proof Seahawks Stadium, engineers designed puzzle-piece buildings, a soft-soil 'pier' and an innovative floating-roof system. A little over 100 years ago, the Seahawks Stadium site was part of Elliott Bay. Imagine for a moment that a 10-building complex was being planned to sit on a pier in Elliott Bay. Further imagine that the complex has a roof covering several of the buildings, but that the roof can be supported by only a few of them. Sound like a challenging project? This is essentially what was done to build the new Seahawks Stadium and exhibition hall complex. To understand how this new facility is structured and what makes it unique, it is helpful to look at three important features: the foundations, the primary superstructure and the roof. A little over 100 years ago, the stadium site was actually part of Elliott Bay. The shoreline used to run east-west through what is now Pioneer Square. In the early part of the last century, Seattle engaged in some of the largest public works projects in the history of the city. Hills were leveled (Denny Hill became the Denny Regrade) and large areas were filled. The entire area, now known as Sodo, was reclaimed from the bay. The area looks like solid earth, but, in fact, it is very soft, both for vertical support of the weight of a building and horizontal support in an earthquake. Buildings in this area need to sit on pilings driven beneath the old floor of the bay into the hard soil that was deposited by glaciers during the Ice Age. The new stadium complex sits on over 1,700 pilings driven 50 to 70 feet below the ground surface. These pilings essentially form a “pier” in the soft soils of the site. The stadium’s damper system disconnects the roof from the concrete support pylons so the roof structure is able to slide in the north-south direction during an earthquake. This system has been used at the base of small buildings and in some bridges, but this is the world’s first use in a large-scale roof. The soils on the site offer more support than what would be provided by water alone — but not by much! Even then, in an earthquake, it is possible for the upper layers of soil to liquefy. This places an additional requirement for the pilings and first floor to truly act as a pier to support the buildings. The demands on the design of the foundation system did not stop there. Since the site of the new structure was the exact same site as the Kingdome, great care had to be taken to avoid conflicts with old pilings. With the emphasis on recycling as much of the Kingdome materials as possible, consideration was given to reusing these pilings. However, the old Kingdome pilings were not in the right locations and did not have the same level of earthquake resistance as the new piling systems. The stadium, exhibition hall, and parking structure are designed to function as one integrated, unified complex. However, to meet structural demands, the entire facility is actually 10 different structures. The exhibition hall is one structure, the parking garage is another, and the stadium is made up of eight separate structures. Temperature effects and potential earthquakes demanded that the building be built in smaller sections, with joints separating each piece. As a structure warms in the summer and cools in the winter, it expands and contracts. 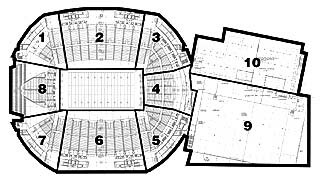 To meet structural demands, the stadium complex actually comprises 10 different structures. The exhibition hall is one structure, the parking garage is another, and the stadium is made up of eight separate structures. If the complex had been built as a single building, the structure would have tried to change size in length by over a foot, tearing apart portions of the building. Designing the complex in jointed pieces avoids these effects. Additionally, Seattle is in the fourth most hazardous of the five U.S. earthquake zones identified by the Uniform Building Code. Everything in the design of this facility had to take these seismic considerations into account. Jointing the large structure into smaller sections reduced earthquake stresses by providing “relief” zones. The stadium has already been through more than 30 earthquakes ... 30 virtual ones and one real one! Extensive computer earthquake simulations were performed on mathematical models of the structural frame to predict forces induced by sway and to size the structural members to carry those forces. As you will recall, the Nisqually earthquake also hit the facility during construction and the structure performed ideally. The grandstand roof structures of the new stadium appear similar to the roofs of Husky Stadium, but work very differently. At Husky Stadium, the roofs “cantilever,” or project out, from the back of the grandstand. This provides all of the necessary support. Due to site constraints and aesthetic goals in the new stadium, only minor, secondary support is provided by the back edge of the seating bowl. The primary support for each grandstand roof is at the north and south ends. The leading edge of each roof section (the edge adjacent to the field) carries the weight of the roof and clear-spans 720 feet between concrete pylon supports. A friction pendulum damper system works as if the roof were supported on wheels on a concave support track. 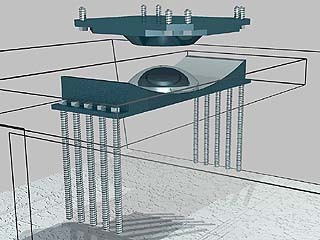 The wheels allow the roof to move independently of the concrete pylon supports during an earthquake. That is a 10 percent greater clear span than the Safeco Field roof or the dome that covered the Kingdome. It would be possible to lay a 60-story building on its side under each grandstand roof (not that you would want to do that!). The system works almost as if the roof where supported on wheels on a concave support track. The wheels allow the roof to move up to 24 inches independently of the pylon supports. If an earthquake hits, the stadium bowl and concrete roof support pylons will sway back and forth with the ground, but the roof will stay still. By disconnecting the heavy mass of the roof from the pylons, earthquake forces are greatly reduced. It is almost like having the roof “float” during the earthquake. This system has been used at the base of small buildings and in some bridges, but this is world’s first use in a large-scale roof. It is not possible to study this project without being drawn by the rich history of the site and the surrounding area. Imagine the reactions of the city’s early settlers and the pioneers to this amazing development. The combination of Safeco Field and the new Seahawks Stadium creates possibly the best, most advanced sports complex in the country. It is likely that these structures would be beyond the wildest dreams of our predecessors. Yet, as one thinks about the scope, scale and construction tools available at the time these pioneers accomplished their regrading and fill projects, their amazing achievements stand side-by-side with those of modern times. Jon Magnusson is chairman and chief executive of Skilling Ward Magnusson Barkshire. He is principal-in-charge of the new Seahawks Stadium, exhibition center and parking garage.